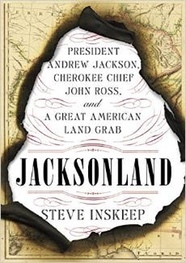 Steve Inskeep is co-host of NPR's Morning Edition and author of Jacksonland: : President Andrew Jackson, Cherokee Chief John Ross, and a Great American Land Grab. The policy called Indian removal has indeed inspired a centuries-long argument. Each generation of Americans has interpreted it differently—arguing at different times that it was inevitable, tragic, mass murder, better left unexamined, or, in the words of an early Jackson biographer, “wise and humane.” Reviewing more than 150 years of popular history about the early nineteenth century reveals how many times the story has changed. This says a lot about Jackson, and even more about the rest of us. In telling the same story in different ways, we are trying to define who we are as a people. Today the United States is changing, becoming dramatically more diverse. That growing diversity demands that we explore the story once again for this generation. It was very different 150 years ago, or even fifty. The basic facts have not changed, although some new ones have lately been found. It’s mainly a question of emphasis. Jackson, a hero of the rising American democracy, took land from Indians throughout his career. He first emerged on the national stage in 1814, when his army defeated Creek rebels in what is now Alabama. Unable to force the last of the rebels to surrender, Jackson imposed a peace treaty on Creeks who had taken his side, forcing his friends to give up 23 million acres in Georgia and the future state of Alabama. Later General Jackson negotiated additional treaties obtaining land for the United States. Jackson and his friends purchased key plots themselves, colonizing the territory with cotton plantations worked by slave labor. Elected President in 1828, he soon signed the Indian Removal Act, which promised to pay for the “voluntary” relocation of natives to new land west of the Mississippi. Jackson said they must move for their own good, to escape the “mercenary” influence of land-grabbing white men. Creeks and Chickasaws sadly moved; Creeks and Seminoles staged bloody rebellions. Cherokees peacefully fought for years through the democratic system, appealing through Congress and the Supreme Court. At last a breakaway Cherokee faction signed a removal treaty, and the troops came. The writer who called Jackson’s policy “wise and humane” was Jackson’s first great biographer, the British author James Parton, whose three-volume work was published in 1860, when the country was about to fall into civil war. Parton cast his subject as the hero of the Union, a short-tempered patriot who turned his violent tendencies to brilliant ends. Jackson won the Battle of New Orleans in 1815, and as president stared down South Carolina when it attempted to nullify Federal laws. Parton did not shy away from Jackson’s brutality, but Indian removal was of little interest. The biographer relied on one of Jackson’s old allies to tell him that it had all worked out well for the Indians. It was the South that most ardently wanted the Indians gone (The North, more advanced in displacing its own native population, could afford to urge the South to be more generous.) After Cherokees modernized their government in 1827, drafting a constitution at their capital within Georgia, the state declared it to be an infringement on state sovereignty and accelerated its campaign for the Cherokees’ departure. Georgia triggered the Trail, making way for the farms of poor white settlers and wealthier families with enslaved laborers. Indian removal was understood to be part of the creation story of the South, and after the Civil War, in the Reconstruction period, distinctively Southern perspectives of this history emerged. Division and Reunion, a popular history of the United States published in 1893, declared that white men “very naturally” would not tolerate red men setting up a government in their midst. The book left out that Cherokees had governed themselves on the same land for centuries. And it all but excused subverting the law to remove them. The author was Woodrow Wilson, and his history was still in print after he was elected president in 1912. A Georgia school textbook in 1913 said slave owners “were as religious, moral, high-minded a race of men who ever lived,” and described the removal of Creeks and Cherokees as an obvious practical response to the problem that their land was needed for white settlement. But there had always been dissenting opinions, and gradually the acts Wilson called “natural” became controversial. The Great Depression made it acceptable to question the history that Americans had been teaching each other. Scholars and writers in the 1930’s highlighted the cruelties of Indian removal; a leader was Grant Foreman, whose Indian Removal quoted extensively from a late nineteenth-century ethnographer who had lived among the Cherokees in their new home in Oklahoma. Those who admired Jackson began finding it necessary to emphasize other parts of his career. In 1945 Arthur Schlesinger won a Pulitzer Prize for The Age of Jackson, a wonderfully written work which made a case for Jackson as a hero of democracy, and mentioned Indian removal in a single passing phrase. Unabashedly liberal in a liberal age, Schlesinger drew occasional parallels with the New Deal era in which he lived: Jackson was cast as a fitting predecessor to President Franklin Delano Roosevelt, a man of the people who like Roosevelt battled the power of entrenched elites. His slaves were shown weeping at his deathbed at the Hermitage, his farm in Nashville. Schlesinger presented this as evidence that their owner was a generous man of the people, though it seems just as likely the slaves were mourning because they had no idea who might purchase them next. Schlesinger shared the sensibility of Jackson biographers like Marquis James, who described Jackson as an “ideal slaveowner,” a mild man who only clapped his laborers in irons when they deserved it. In 2009, Congress passed and President Barack Obama quietly signed a formal apology for the Trail of Tears. But Congress also specified that Native Americans could not use the apology to reclaim land, and the historical pendulum was already swinging back. Recent Jackson biographers, such as Jon Meacham and H.W. Brands, candidly described the human cost of Jackson’s policy while keeping it in the perspective of his broader career. 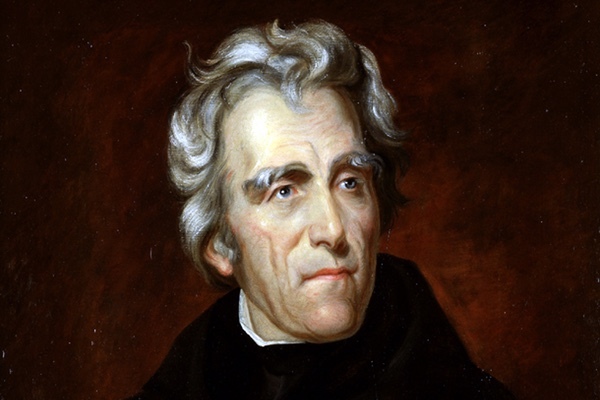 Sean Wilentz, in The Rise of American Democracy, observed that while Jackson was a “paternalist,” telling Indians what was best for them, paternalism was not the same as genocide. Ross deserves to stand alongside Jackson. They belong together, two very different characters who fought it out in a democracy, just as we, their heirs, must do. Jackson can take the criticism; he predicted in1814 his political critics would destroy themselves: “The snarling curs may grin—lie—and falsely swear but they will die from their own bite.” Ross, who resisted Jackson for more than twenty years, is just as confident, just as durable, just as American, and ready to go. i The video, narrated by Martin Sheen, was excerpted from Andrew Jackson: Good, Evil and the Presidency, a documentary released on DVD in 2008, and viewed at the Hermitage, August 17, 2013.